Do you own a master-of-all-trades weapon, a rifle with which you can take large and small game? How about one that can defend your family and home from an attacker or multiple attackers? Something accurate enough for long-range shooting, but something handy enough for close-range fighting? A weapon you can carry with you without anyone knowing? If there is a weapon out there that can do all this, I want it, and I want it bad. Unfortunately, there isn’t a weapon I know of that has mastered all of these traits. A lot of weapons can be jacks-of-all-trades and can fit several of these requirements; however, they master even fewer of them, and even then probably not fill all of them. You can what-if me all day with things like “my folding stock means I can fit it under my trench coat or in my duffle bag.” Well any guy in a trench coat is suspicious, and any gun in a duffel bag isn’t exactly on hand. So since we don’t have one gun to rule them all, we get the joy of justifying owning multiple guns to our significant other. If you can’t look at your spouse and say, “Honey, it’s for the zombies, ” then why get married in the first place? I’m going to give a rundown of the weapon types I think everyone should own for when things get tough or just to have in a respectable gun collection. Few of us need an excuse to own another weapon though. I’m simply listing broad types since the actual weapons will always be up to debate. 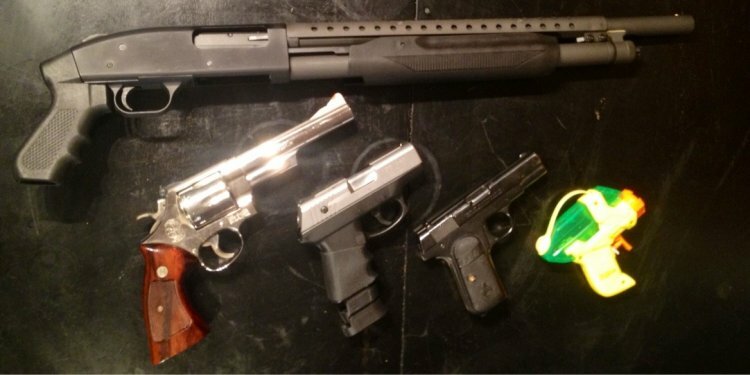 The one thing these all need to have in common is a common and easy-to-find stockpile ammo. I love the 22-250 round. It’s expensive but common enough, so I don’t stockpile it. Now, the .308 is incredibly common, and surplus rounds are relatively affordable. This could be the most important firearm you could ever own. This rifle can be used for defense and hunting. With proper shot placement, even smaller rounds like the 5.56 are good for hunting medium game. This rifle should be magazine fed, semi-automatic, accurate out to a minimum of 300 meters, and chambered in a center-fire rifle cartridge. The magazine should also be detachable to insure not only quick and easy reloads, but also because owning multiple magazines means one can break and you’ll have extras. The magazine should have a capacity of no less than twenty rounds, unless of course you live in a state that you need to vote the politicians out of. The weapon should feature dependable iron sights, and though not required, a quality optic should be able to be mounted. Rifles like the Browning BAR (not the machine gun) are a great hunting rifle, but a substandard battle rifle.